Less than a year after incorporating and earning one of StartUp Worcester’s new entrepreneurial awards, Petricore Inc. continues to grow its reputation and product line. The game company has released its newest game, “Gelato Flicker,” on IOS, with a release for Android systems expected later this month. In addition, the company has expanded into new areas within the contractual work it has, so far, relied on to support its game development, according to CEO and co-founder Ryan Canuel. 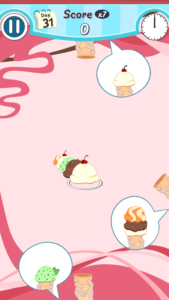 The game is based on the idea of selling ice cream to hungry customers. As customers line up, players swipe the correct order to the customer. As players progress, the game gets harder. Ultimately, players progress from the owners of an ice cream stand, through a trucks, a store, a factory and a town before becoming king of an ice cream planet! Since Petricore released the puzzle game “Mind the Arrow” in July, Canuel said the company has learned much about the industry, especially how to monetize a game. When “Mind the Arrow” launched, Petricore’s team had already been working on a mobile app that for a doctor that would be able to be used by patients. Petricore has also expanded its contractual work into a new area, virtual reality. The customer, Attunity, an international data management company with a Burlington office, was looking for an interesting and unique way of selling their product while at trade shows, Canuel said. Petricore developed a virtual tour through a d atabase using Google Cardboard, a virtual reality viewer. With the business side attracting more interest, Canuel credited Petricore’s team with completing a heavy workload over the past four months that enabled a new game launch, an update and a new app.